Our modern-day frenetic healthcare culture has progressed to a state where healthcare professionals tend to detach themselves from the emotions of their patients/clients, rather than embed compassion into their daily practice. The AMS Phoenix Project: A Call to Caring was implemented with the goal to instil and sustain empathy and compassion in environments where clinicians learn and work. The purpose of this study is to report on how an interprofessional community of practice (CoP) of healthcare educators can contribute to a cultural shift in promoting and delivering compassion in healthcare through health professionals education. Using an imaginative creative autoethnography that adopts a narrative design through graphic illustrations, data were collected from 25 members of the Phoenix@Queen’s CoP during a 1-day retreat. Data collection included a graphic recorder who visually depicted all retreat dialogue, field notes that highlighted emergent themes and artefacts produced during the day. Audio recordings of the discussions were used as secondary sources of data. Using thematic analysis, three themes emerged: the call to caring is a long and winding road with many barriers and rewards; CoP members experienced personal growth in and through the community; and the Phoenix@Queen’s CoP matters in terms of professional relationships, leadership and moving forward a shared agenda about practising compassionate healthcare. This study describes the development of a CoP that moves away from traditional committees and discussions to an experiential creation of connections and shared meaning by its members. By using autoethnography, and by demonstrating how graphic illustration can be an innovative and creative method for recording and interpreting group discussions, we have demonstrated the accelerated development of an authentic CoP. With a richer and more authentic community, the shared goals of healthcare professional educators are more likely to be achieved. The AMS Phoenix Project: A Call to Caring was implemented with the goal to instil and sustain empathy, compassion and professional values in environments where healthcare professionals learn and work. To accomplish this goal, the AMS Phoenix Project awards fellowships and grants to individuals and teams interested in: (1) developing creative strategies for caring in both educational and clinical practice, and (2) developing a community of practice (CoP) that will advance the delivery of compassionate healthcare. The AMS Phoenix Project grants and fellowships programme gave us the opportunity to build a CoP of healthcare profession educators, at our institution, who all wished to promote the delivery of compassionate healthcare. At the time of this study, the AMS Phoenix Project: A Call to Caring had awarded faculty at our institution three fellowships and five grants (table 1). On 22 June 2015, and with support from the AMS Phoenix Project, we convened a 1-day retreat for those who had received a 2012–2015 AMS Phoenix Project fellowship or grant and their research team members (n=25). The overarching purpose of the retreat was to identify the ways in which the interprofessional CoP has contributed to the development of new knowledge about compassionate healthcare and to explore the role of medical humanities in facilitating the expression and diffusion of that knowledge. This article reports on what we learnt from the 1-day retreat, which was enhanced by the use of graphic illustrations. Our review of the retreat offers implications for others interested in the ways in which CoPs can contribute to cultural shifts in healthcare and how graphic illustrations can enhance CoPs. A brief description of a CoP is discussed before introducing the retreat format, data collection and analysis. Findings are described in relation to the three graphic figures created as part of the retreat process. The AMS Phoenix Project: fellow and grant projects. The idea of a CoP initially arose from the work of Lave and Wenger7 8 and was derived from the social learning theory entitled situated learning. According to Seibert11, three structural elements describe a CoP: community, practice and domain. The community represents the members, who are distinguished more by relationships and interactions than by a roster of the involved members. Practice includes the knowledge, skill and attitudes for the enterprise of the domain and the community. Domain denotes the identity, purpose or common goal of the community. The community is united and inspired by the domain. Meaningful and sustained relationships and shared ways of engaging are two core elements of a CoP,13 and a supportive work environment is seen as an important antecedent to practice improvement.14 Consequences of the CoP range from personal outcomes for community members to improved organisational outcomes,11 and Wenger et al15 propose five outcome cycles, including: (1) immediate value; (2) potential value; (3) applied value; (4) realised value; and (5) reframing value. For each of the five cycles, one can define and monitor indicators of value creation and collect relevant data for outcome assessment. 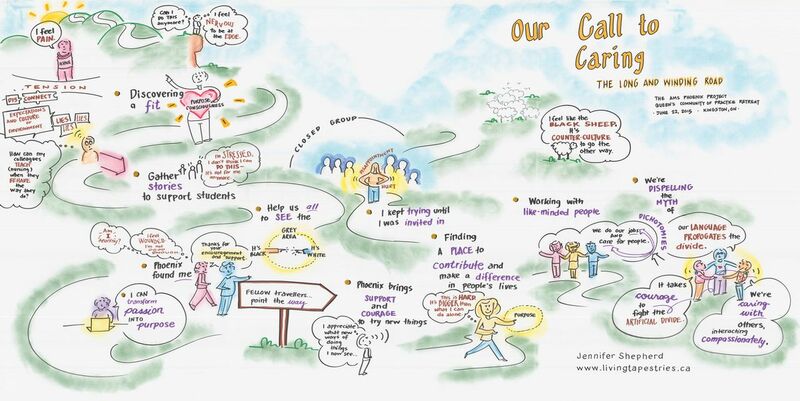 As a group of interprofessional healthcare educators who are promoting the delivery of compassionate healthcare, we chose an autoethnographic method to tell the story of how our CoP was strengthened through graphic illustrations. This creative approach16 used collective reflection17 in a narrative design to summarise the graphically recorded narratives of our experiences participating in our AMS Phoenix work. These were initially uncovered and captured during the retreat and subsequently our collective reflections around the graphic illustrations themselves. Our CoP will herein be referred to as Phoenix@Queen’s. Below we describe the format of the retreat where the CoP was brought together to create the graphic illustrations and the subsequent narrative reflection exercise. The purpose of the retreat was to: (A) record the narrative accounts of how members of the CoP came to be engaged in Phoenix@Queen’s; (B) document the impact of individuals’ experience of being part of the CoP; and (C) document the outcomes of association with Phoenix@Queen’s at the level of their respective community (ie, occupational therapy, medicine, nursing and physiotherapy). How did you ‘come to’ your association with AMS Phoenix? How has your association with AMS Phoenix Project affected you as an individual? How has your association with AMS Phoenix influenced how you think, what you think about or how you view yourself in relation to your learning and work environment? Identify who or what your ‘communities’ are; explore how the AMS Phoenix association shaped the purpose and/or the process and the actual or potential outcome of your engagement with your ‘communities’? What are the future goals for our CoP? The retreat was led by an external facilitator who was faculty at another Ontario university, was an AMS Phoenix Fellow and was in the process of fostering a CoP at her institution. Therefore, she had a clear understanding of the retreat goals and was integral in setting the retreat tone and format. She was not a researcher for this work. To meet retreat objective 1 and to encourage the sharing of narratives, the day began with a walking meditation. Walking meditation (mindful walking) is a Buddhist practice that focuses on mind–body interactions.18 This included breathing, awareness, concentration and relaxation, all while walking slowly.18 As participants walked around the dimly lit room, they were asked to voluntarily share their stories about how they came to be associated with the AMS Phoenix Project (narrative prompt #1). Participants then completed a ‘silent sort’ to determine how the AMS Phoenix Project affected participants personally and influenced how they thought and viewed themselves in relation to their learning and working environment (narrative prompt #2). The ‘silent sort’ was composed of two phases: (1) individually, on three separate sticky notes, participants identified three ways the Phoenix Project affected them as individuals and influenced their thinking; and (2) notes were then cluster/sorted into common themes by participants. Once all the notes were grouped into themes, responses were discussed and moved to more appropriate thematic groupings as needed. Retreat objectives 3 and 4 were met through small and large group discussions. Throughout the day, the graphic artist created visual representations of the discourse throughout the day, as described below. We used graphic facilitation, an art modality in which the artist creates a large visual image based on the group discussion, as a way to visually summarise our group dialogue and interactions. Graphic facilitation is a form of narrative interpretation in that the graphic artist at the retreat listened to our story in the conversations, translated verbal and non-verbal inputs into visual forms that synthesise and integrate both our individual and group thinking. The graphics provide a representation of ideas and feelings in a visual format through the use of colour and easily understood drawings. It represents the substance of what emerges from our group discussion, as well as the dynamics of the group interactions as participants engage with each other on a variety of topics. The graphic artist recorded text and pictures to translate our stories into visual metaphors, in the moment, and produced images and text that were meaningful to all participants. The graphic illustrations were informed by the activities done throughout the day—individual stories told during the walking meditation, the silent sort and small and large group discussions. Throughout the day, the graphic artists would consult with participants to help ensure that her synthesis represented group members’ experience and point of view. By recording group discussion in three graphic illustrations, participants were able to view the emerging story about individual and group experiences within the Phoenix@Queen’s CoP. Data were collected from 25 participants; all were female and represented a number of different professional disciplines that included a representative sample from the schools of nursing (36%), rehabilitation therapy (28%) and medicine (36%). Data were collected through a variety of data collection techniques including walking meditation (mindful walking),18 small group and large group discussions, a silent walk and a silent sort. Data that were used to inform the graphic illustrations included recorded field notes, completed independently by two research associates, that summarised the main themes and identified quotes from the group discussions and activities that occurred throughout the day. The discussions were also audio-recorded to ensure field note accuracy. Data were analysed using a thematic design.19 The graphic illustrations, field notes and facilitated group reflections were grouped into three overarching themes. The audio recordings were considered a secondary data source and referred to when clarification was needed with respect to the graphics, field notes and/or quotations. The results, derived from the three graphic illustrations, are divided into three distinct themes and are summarised below. Each theme corresponds with one of the graphic illustrations. Figure 1 illustrates the ways in which the CoP members came to be part of the AMS Phoenix Project and what drew participants to think, vocalise and enact compassionate care within their respective health disciplines (ie, goal 1). Interpretation of the illustration begins on the far left, where CoP members described the catalyst moment and/or the context from which they chose to seek connection with the work of AMS Phoenix Project. Facilitators that led to connection described by participants include the experience of pain, disconnection or tension between their expectations of healthcare culture and the reality. They also recognised a personal fit with the values of the Phoenix Project. There was a sense that vulnerability was legitimised by connection with others who were facing similar challenges in their respective environments. These ‘fellow travelers’ served as guides and as coaches who encouraged each other to achieve their Phoenix Project/fellowship objectives. The path was described as non-linear, with setbacks and challenges along the way. Notably, connections were made with those seeking entry into the CoP who were not grant or fellow recipients. Also, several participants reported that the CoP offered a safe and supportive environment where they can discuss and research compassionate care. The CoP provides individuals with the support they need to ‘go against the grain’ and offer compassionate care in environments that tend to minimise the importance of that aspect of patient care. One person spoke about the courage this group gave her to teach residents about practising compassionate care, stating that one medical residents said to her, ‘I learned I can actually do my job and care for patients’ (P8). She believes that he now knows he can play by the ‘rules’ and engage in compassionate care because she now has the courage to practice both. The graphics depicted in figure 2 outline how our involvement with the AMS Phoenix Project influenced our self-identity, our work and our personal and professional lives (ie, goal 2). Five themes are summarised: awareness of human connection, courage, authentic self-identity, community and realising possibilities. Personal growth in and through community. Our Phoenix work is counter-cultural and often lonely. This figure summarises our collective perceptions of the meaning of participation in the Phoenix@Queen’s CoP. The CoP was a necessary force to create a space where we could draw from and receive support in order to engage in new ways of thinking about and studying healthcare education through a compassionate lens. We identified a number of inter-related constructs including courage, the awareness of human connection, finding our own authentic self-identity and the ability to realise possibilities. Through sharing our respective work, we felt a sense of optimism around our ability to make meaningful changes in our workplace cultures. The CoP that has emerged from our sharing connects individuals with like-minded ideals who offer a safe space, appreciation, acceptance, support, encouragement and inspiration to each other. Finally, this image represents our personal stories of growth and development, and how these stories reflect the growth and development of the Phoenix@Queen’s CoP. All of us, as individuals and team members, stated that we developed an authentic self-identity through working on the AMS Phoenix Project. It gave us a ‘home’ and a ‘place that I feel welcome and supported’. Some of us identified that through the CoP, we have been able to build a team/network of trusted individuals who work collaboratively to produce work that provides us with ‘a deep sense of worth’. Our collective group stated that the AMS Phoenix Project and the Queen’s CoP are important for providing us with opportunities to explore innovative and creative ways of providing patient care rather than continuing with traditional approaches. Some of the concepts generated from the ‘Silent Sort’ included phrases, such as ‘the art of possibility—Inventing the future’, ‘productive defiance’, ‘new lens to view medical/health education’ and ‘compassionate process creates a safe, creative and meaningful space to enhance [the] rate of work/productivity/outcome’. Community was another emergent theme that appeared to influence us both personally and professionally. The Phoenix Project provided the conduit for developing a CoP who have a common interest—one where we feel that we belong rather than feeling like an outsider. Although some of us did articulate the fact that we are comfortable inside our community, whereas we are reluctant to take it outside to boardrooms, classrooms and clinical practices. This lead to the formation of sticky notes clustered around the concept of courage (also identified as a theme in goal 1). We realise we must possess the courage to make changes to the mainstream healthcare behaviours and attitudes if compassionate care is to become a systemic change. We expressed a need to expand the CoP to include others outside the Queen’s environment. We began to understand the importance of being inclusive of others who ‘may not agree with all the values of [our] existing community’ in order to include a variety of perspectives. It was through this interaction that we began to realise that our work does have the potential of affecting real and meaningful change. The third section of the retreat focused on discussions about how work on the AMS Phoenix projects and fellowships affect communities/relationships by identifying the various communities to which they belong, and how an association with the CoP shaped the process and outcomes of their engagements with their identified communities. They concluded that their communities spanned from teachers, learners, patients, students, researchers and colleagues to family, friends and community organisations. When asked how the association with the Phoenix Project influenced the communities identified, the most common responses stated that they became: (1) more focused and present (including as a parent); (2) a caring teacher; (3) a better listener; (4) more creative and willing to share; (5) more inspirational and courageous as a role model—‘walking the talk’; (6) more supportive as a supervisor and colleague; and (7) better able to normalise and legitimise compassionate care in their professional life. They concluded that the Phoenix CoP allowed them to legitimise and affirm their work and their patient-centred care approach. As the facilitator concluded, ‘There is nothing soft about the courage to normalise emotion within human experience’. Figure 3 summarises the ripple effects that result from our participation in the Phoenix@Queen’s CoP. We have experienced the cascading impacts of leading from the values of compassion, caring and the priority of relationships. Starting at the inner most and personal levels of our relationships, through to our immediate professional roles and beyond, these impacts speak to the way in which we have seen humanity reinstilled into our day-to-day work. These impacts also speak to the ways in which we were liberated to build spaces for others, to work towards creating more resilient communities and to legitimise and affirm the values of true patient-centred care. The brightness of the image captures the hope and inspiration we have experienced as CoP members: that there is a promise of a better way of being and doing our work. With many meaningful statements covering the page, we are reassured that our work has broader implications and in a very simple sense, represents ‘the right thing to do’. The Phoenix@Queen’s CoP provides a legitimate venue from which to move our shared agenda forward, without feeling marginalised. During the final activity of the retreat, participants brainstormed the strengths of the AMS Phoenix at Queen’s CoP and the ways in which we could mobilise work. The strengths included initiating collaborative groups, providing leadership opportunities, offering a safe environment to advance compassionate healthcare, support research initiatives and production of educational resources. The retreat participants then brainstormed the most effective ways that we could disseminate our work. Dissemination strategies included conference presentations, a monograph, infiltration strategies (eg, meetings, curricula and discourse), artistic renderings (eg, poetry and artwork), narratives, video/photo-documentary, blogs, a paper for publication, a Queen’s Phoenix Symposium and developing teaching and learning strategies about compassionate care. We used graphic illustrations to build, strengthen and uncover ways our CoP supports healthcare professional educators interested in promoting the delivery of compassionate healthcare. We believe that other communities of practice can use this method to enhance the value and deliverable of their groups. We tell the story (narrative) of our experience with the hope that it will help others. By using autoethnography and by demonstrating how graphic illustration can be an innovative and creative method for recording and interpreting group discussions, we have demonstrated the accelerated development of an authentic CoP. These methods have not been widely used in healthcare professional education, though our experience illustrates certain advantages of this process over traditional discussion groups and committee meetings within a large organisation.20 In contrast to conventional meetings, graphic illustration provided a real-time, tangible diagrammatic representation of the generation and interconnection of ideas from the CoP. In a sense, this could be seen as a ‘fast-forwarding’ of the process where analysis occurs early, thus making a graphic illustration a time-saving process in the end with increased effort put forward early. Graphic illustration also provided richer and more detailed deliverables than those that would have been generated from a traditional meeting with conventional agenda items and minutes. Overall, participants identified barriers and rewards related to their work, in addition to personal and collective growth, with the ultimate goal of moving forward a shared agenda: the promotion and delivery of compassionate healthcare through health professionals education. By using graphic illustration to record our stories and conversations and by engaging in structured reflection, we identified the ways in which our CoP achieve three of the five outcome cycles described by Wenger et al.21 (eg, immediate value, potential value and applied value). On an individual level, CoP members expressed immediate value outcome through the support provided by like-minded individuals, who legitimised and affirmed their work on compassionate care, and by identifying the need to expanding the CoP, and include others who ‘may not agree with all the values of [our] existing community’, participants recognised the opportunity for future leveraging of members’ knowledge capital. Finally, participants identified applied value outcomes through their discussion of their funded projects and fellowships. As academic leaders from a variety of healthcare professions, we realised that the goal of promoting compassionate care has become a significant part of our work. With support of the CoP, we have been able to include goals around compassionate care in teaching, research and administration. Yet, we also realised that we still have much to accomplish. Specifically, we realised that influencing the broader culture will require increased stakeholder engagement in the CoP and potentially forced involvement. Forced communities of practice include individuals who are grouped together based on location or superficial connections, and it is known that forced formation of communities of practice are not as useful as an authentic CoP for moving ideas forward and shifting culture.21 As we move forward with our work, we are formulating our next steps, and reflecting on questions of broader CoP engagement, and on the implications for our existing CoP if we move towards a more forced membership model. Our experience as described in this autoethnographic paper has been that of an accelerated development of a CoP facilitated by the use of graphic illustration. The use of graphic illustration allowed for the experiential creation of connections and community in a process that moved away from the traditional discussion methods of committee meetings. This novel approach that we embraced as a group of healthcare educators could be used by groups of scholars, educators, interprofessional groups and those who experience vulnerability in their work, especially given the advantages of this model (eg, accelerated development of a CoP, illustrations to assist in shared understanding and goals and creating a safe, respectful and supportive environment). We feel that with the development of this authentic community, and our interprofessional connections built through the experience itself, we are more likely to achieve our goal of promotion and delivery of compassion in healthcare. We would like to thank the AMS Phoenix Fellowship and Award program fortheir support, and to all the CoP members who participated in the retreat. We would also like to thank the facilitator, Dr. Marion Briggs, and the graphic illustrator, Jennifer Shepard.
. Compassion: an investigation into the experience of nursing faculty. Int J Hum Caring 2006:10.
. Flow of compassion in health care: moving beyond an individual towards a systemic focus. In: RCN International Nursing Research Conference: University of Oxford, 2017.
. Compassion in healthcare—the missing dimension of healthcare reform. Caregiv Stress Staff Support Illn Dying Bereave 2011:49–61. AMS Phoenix Project. Bringing compassion to healthcare. Assoc Med Serv 2017 http://www.ams-inc.on.ca/ (accessed 7 Jun 2017).
. Situated learning: legitimate peripheral participation. Cambridge university press 1991.
. Communities of practice: learning, meaning, and identity: Cambridge university press, 1998.
. Cultivating communities of practice: a guide to managing knowledge. Harvard Business Press 2002.
. Promoting and assessing value creation in communities and networks: a conceptual framework. Report 18: Ruud de Moor Centrum, Open University of the Netherlands, 2011.
. Reward through collective reflection: an autoethnography. E-J Bus Educ Scholarsh Teach 2010;4:11–18.
. Research in education: evidence-based inquiry: Pearson Higher Ed, 2014.
. 12 What is a community of practice and how can we support it? Theor Found Learn Environ 2012:286. Contributors All authors have made substantial contributions to this work. They have given final approval and are accountable for the content. Funding This study was supported by AMS Phoenix Project Call to Caring Grant. Ethics approval This work received ethics approval from Queen’s University and Affiliated Hospitals Health Sciences Research Ethics Board (file #: 6015856).